XI'AN, China, Nov. 8, 2018 /PRNewswire/ -- Home to approximately 200,000 programmers, Xi'an, the capital of China's Shaanxi Province, hosted the second Global Programmers' Festival (the "Festival"), is welcoming new opportunities and challenges presented by the digital economy. Industry leaders, top programmers, renowned experts and scientists from around the world have joined the 2-days Festival themed "Coding the Society". Parallel sessions were hosted in Silicon Valley, Bangalore, Beijing and Nanjing, where programmers discussed the prospect of "digital Xi'an" and software's role in helping to shape the future. Shangguan Jiqing, Deputy Secretary of the Xi'an Municipal Party and Mayor of Xi'an, noted that the digital economy is the future of the world economy and that Xi'an is seizing the historical opportunity to position itself as a center of development for the technologies that will power this new era. "Today, Xi'an is coding the new future of our digital economy with an all-new algorithm. With enthusiasm and sincerity, we welcome elite programmers and industry leaders to come to Xi'an and help 'upgrade' our 'system' and shape a better and stronger future," Shangguan said. A programmers' "Walk of Fame" was unveiled at the Festival, which includes handprints of people who've made significant contributions to the Chinese software industry, including Wang Yongmin, Yan Yuanchao, Gong Min, Qiu Bojun, Lei Jun and more. In addition, Xi'an released two reports at the Festival's opening ceremony, "The Development Path of China's Software Industry" and "Industrial Informatization Development Index of 'Belt and Road' Countries." With the goal of integrating information technology and urban development, Xi'an is accelerating the establishment of a comprehensive ecosystem for the digital economy. The city is rapidly expanding its software and IT industries to build the new digital "Silk Road" on a larger scale, attracting programmers to work here and make Xi'an a top Chinese software city. 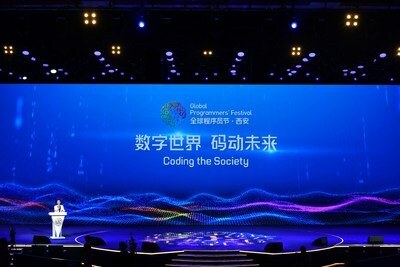 The Global Programmer's Festival, with the permanent topic of "Coding the Future" invites industry leaders and tech elites from home and abroad to gather in Xi'an. The festival aims to build talent, capital investment and innovation through a series of forums and competitions. As a leading annual event in the tech industry calendar, it provides a national platform for programmers from across the world to communicate, share ideas, inspire innovations and grow together.